Funny story how Dr Schuster and myself came to be friends, I was boarding an airplane in Tokyo, Japan. I overheard him talking about where he was going; his destination, the same as mine, was a remote medical camp in Bandipur, Nepal. I introduced myself and sat down. During our time in Nepal I was assigned to be his assistant, we instantly hit it off and thus an interest in medicine was sparked in me. By the end of our trip 2000+ patients had been treated and a new friendship was born. When I returned to the U.S.A. Dr Schuster offered me a job in his office and I accepted. I worked for him for about two years and during this time we traveled to the Philippines and Sri Lanka following the 2004 tsunami. While working with Dr Schuster whether in Asia or in Boca Raton, I was exposed to the real life representation of what a humanitarian is and was inspired to go back to school to be a nurse. Through Dr Schuster's generosity, compassion and leadership this work has become a passion in my life and I can easily say my life has changed drastically since that coincidental meeting of ours in Japan. The Bicol Clinic has now hosted me three times in the Philippines and each year I attend I see how this foundation is growing by leaps and bounds. My first time there Dr Schuster's family and I were the only volunteers and we worked out of a bamboo shack with only one room, the second time I attended the clinic had been established but we had a two hour commute to it every day. Now with the completion of the dormitory due to your generous donations, we are able to sleep on the clinic grounds, walk to the clinic in the morning and spend the extra time and money on patients rather than commuting. These are just a couple examples of how fast and efficiently this foundation is growing. This past year with the help of the ten medical students, we were able to go out into the local hospitals and clinics and do some research, perform many more treatments, surgeries and overall help a much larger group of Filipinos. One project Dr. Schuster initiated was to keep track of those patients who required surgery, but were much too sick for us to handle, so I started a list. The first one on it was a 17yr old college student, who desperately needs a kidney transplant. I took his info down and immediately started investigating how to help. After many hours and multiple visits I am extremely happy to say we have found an American donor to pay for the surgery and he is currently undergoing the pre-surgery testing and exams and will have the surgery as soon as that is finished. This is one of many success stories that have come to us at the Bicol clinic through your generous donations and support. I could go on and on about the kind of person Dr Schuster is and the kind of foundation he has created, but I think I have given you all a glimpse. Dr Schuster has a driving force in him propelling him to help those in need; rich, poor, young or old he has changed my life and thus helped me help others. My life as a first year medical student quickly turned into a race to fit esoteric packets of information into my brain at least as rapidly and as well as my classmates. By the end of it, I found myself lost in the textbooks and exams, forgetting why I entered medicine in the first place. While I loved school and enjoyed what I was learning, I was very worried that I was losing my identity. I am not exaggerating when I say that BCF saved me from myself both professionally and personally. BCF provides a safe and supportive - albeit exotic and challenging - environment in which to begin the practical application of my pre-clinical education. The hands-on clinical experience allowed me to begin making connections which I wouldn't have been able to make until my 3rd year or later. 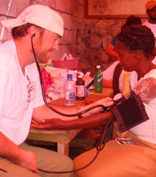 The opportunity to work in a diverse team composed of medical students, nursing students, interpreters, nurses, and doctors of varying backgrounds and levels of experiences was good practice for my future, especially giving the changes in the delivery of primary care which emphasize the healthcare team rather than the solo doctor. Moreover, I couldn't have hand-picked better teachers. Dr. Schuster, in particular, is an inspiration. He is an extremely knowledgeable, patient, and approachable physician who leads by example. He provided an excellent role-model who helped me realize that it is possible for Doctors to be well-rounded individuals, and reinvigorated my drive to maintain those important parts of my person that make me unique. There was the perfect balance between hard work and down time. I felt sufficiently challenged, but not overwhelmed. We had plenty of time to enjoy excursions into the area and to get to know each other and some of the local Filipinos. When people ask me about the trip, I tell them it was one of the best decisions of my life. It renewed my enthusiasm for medicine and I strongly believe that I will be a stronger healthcare provider from it. I've done my best to describe this experience, but honestly I think it's impossible to do it verbal justice. I didn't know if was possible for any experience to be so consistently and extraordinarily positive. Even after this summer, I know that BCF will continue to be an important part of my life.